I’m so glad I’m out of the couNtry for Halloween – I cam so relate! Is that you singing?! You are funny AND multi-talented! I’m laughing and in awe. This year, I only bought candy that I think I can resist, i.e., nothing chocolate. I’m telling my kids (who are in high school and shouldn’t be trick-or-treating anyway) that they either have to eat all of their Reese’s right away or throw them out because I have no willpower at all when faced with Reese’s. Yep – it’s me, warbling on the high notes, and thinking about YOU and using my “head” voice or whatever that is that I’m supposed to do. 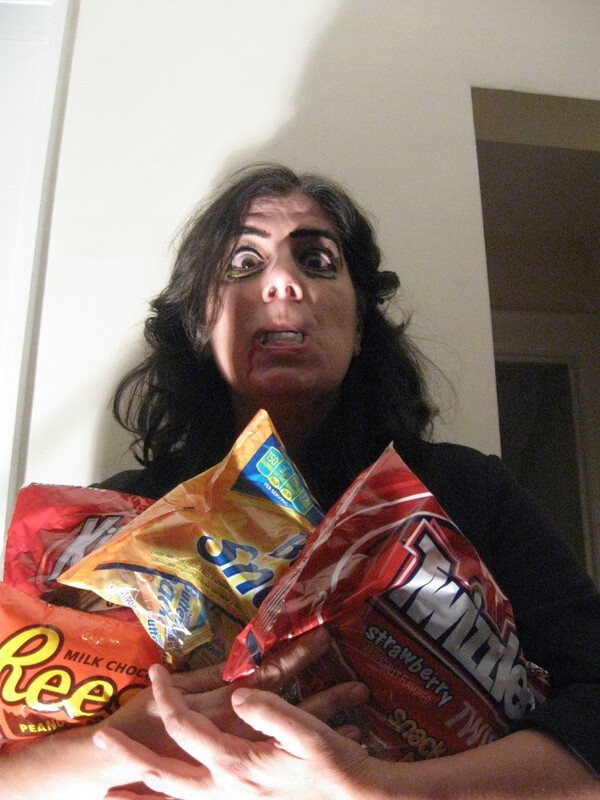 My halloween trick is usually to wait until that day to buy candy, but I had to buy some early for the photo shoot! Great job with lyrics. Audio didn’t open. I long ago figured how to avoid the Halloween lead in to the holidays. I give Trick or Treaters individual bags of popcorn or pretzels. They seem to like them.Mom’s and dentists definitely like them. And unlike chocolate, I can eat the leftovers at a reasonable pace. Ivy, you have missed your calling with your full-time job. This is incredibly funny. I love your singing. I’m not sure how long this took you to come up, but you should consider writing songs.